Hours after the UK Government published it’s economic consequences of a ‘No Deal Brexit’, forecasting a 9% loss of GDP after 15 years, the Bank of England set forth it’s No Deal Economic Armageddon scenario, literally warning of economic collapse on a scale twice that of the 2008 Financial Crisis. One of a near imminent currency collapse, GDP collapse of 9%, house prices crash of 30% and inflation soaring to over 6.5%. The British public are being subjected to fear mongering on an even greater scale than that which the Bank of England was peddling prior to the June 2016 EU Referendum, then warning of a Brexit recession if the UK to leave, none of which materialised as the UK economy continued to grow on a similar trend trajectory it was on as before the EU referendum result. Over the weekend, EU leaders approved the agreement with the UK’s withdrawal plans allowing Theresa May to bring the deal back to the House of Commons for parliamentary approval in the coming weeks. The timeline that is currently in play is December 12th, one day before the official EU summit is due to begin. Up until that date you can expect plenty of commanding commentary from the PM about the “delivery of the people’s will” as she attempts to rally the public and opposition to the current deal. 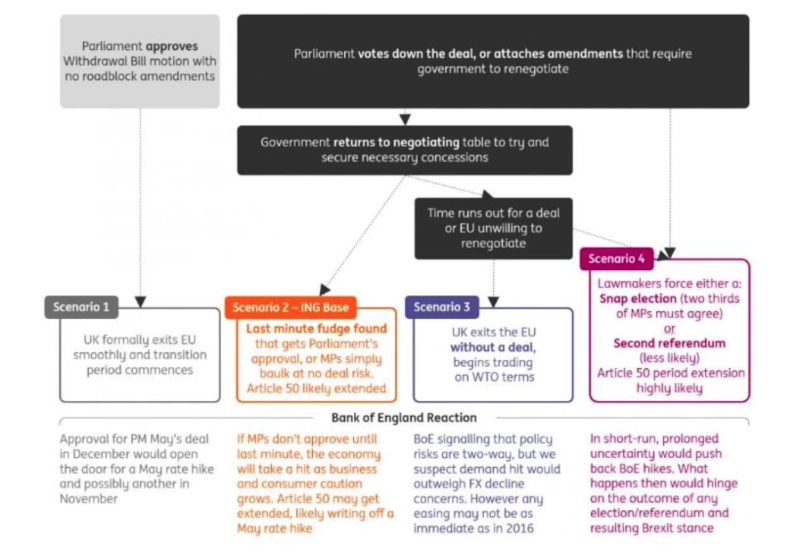 With this in mind, I would anticipate further large bouts of volatility and agree with ING’s view (below) that MP’s will not approve the deal until the last minute when the prospect of a ‘no deal’ causes a short-term collapse of the GBP forcing MP’s to vote through the proposal on the second attempt which would likely involve an extension of Article 50. First, let me repeat my overall take of crypto currency. I believe that crypto is here to stay for at least 2 reasons. One is that it enables rapid, low-cost transactions. It is the thing that banks fear the most: a way to bypass them. But they also recognize a winner when they see one and they are trying to harness the underlying blockchain technology to obsolete their workforce. Second, BTC enables China, Russia, Iran and others to pursue non-dollar transactions. In fact, the entire starting point for Satoshi’s creation is de-dollarization. Put differently, BTC will always have a home for those who don’t want U.S. dollars. Last week the market said that BTC was worth 15% less than it was worth the previous week. Some people will claim that it is tied to a branch in the crypto currency. No. That would not affect all cryptos. More basically, this has been a trend based selloff. A technical read says that is an indication of further lows ahead. Sure it could bounce back in the near-term. But it looks like the future isn’t as strong as many thought. And this is BTC specific. The market was relatively unaffected. Crypto currencies just collapsed. #1: Bitcoin has failed it’s first big test. It is clearly not a hedge against market crashes or volatility. And frankly that is the only reason to own it. #2: Most owners are underwater. Anyone who bought in the last 15 months and held is now losing money. And over half of buyers bought in the last 12 months. It’s evident in the trading volume, which has steadily drooped 50% in just the last 6 months. Buyer interest is tapped out. As the novelty continues to wane, BTC will be left with more down days ahead.